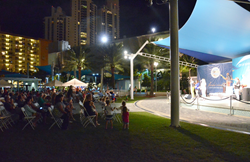 The 2016 Sunny Isles Beach September special event line-up offers an outdoor concert, a talent show and a competitive fishing tournament. Music aficionados, anglers and budding talent of all kinds will be welcomed at various venues throughout the City on three consecutive Saturdays beginning September 10. A Sunny Serenade Concert will be held at Heritage Park (19200 Collins Avenue) at 7:30 pm on Saturday, September 10. A returning local favorite, VIVA, will perform classic rock and roll tunes until 9:00 pm as the crowd sways and dances to the music. Entrance is free, as is parking which is available in the park’s garage or under the William Lehman Causeway. Within the City, patrons may hop on the free SIB Shuttle Bus marked “Special Event” for a ride to and from the park. The 5th Annual SIB Talent Show will take place from 7:00-9:00 pm on Saturday, September 17 at Heritage Park. Participants must submit an entry application including waiver and media release no later than Friday, September 2 at 5:00 pm. Registration is open to Sunny Isles Beach residents only. All performers must try out, no walk ups will be accepted the night of the show. The event is open to the public with free admission and parking provided as mentioned above. The SIB Family Fun Fishing Tournament will take place at the Newport Fishing Pier (16501 Collins Avenue) on Saturday, September 24 from 9:00 am-noon. Pre-registration is ongoing at $5 per SIB Resident ID Card and $10 without the City resident card. Fishing poles are available to rent only if pre-registered. One line per entrant is allowed and fishing is only from the pier, not the shore. Other rules are available at time of registration. Join other anglers to compete for a chance to win prizes totaling $10,000. For more information about these events and more, visit the City’s official website at sibfl.net, tune to SIBTV on Atlantic Broadband Channel 77 (107-5) or AT&T U-verse Channel 99 or follow the City on Twitter, Instagram & Facebook (@CityofSIB). For questions, please contact Cultural and Community Services at 305.792.1706.